Early 1970, and Tiny Tim - widely known for his unusual falsetto voice and ukulele prowress - had a 10-night engagement at Sydney's Chevron Hotel. 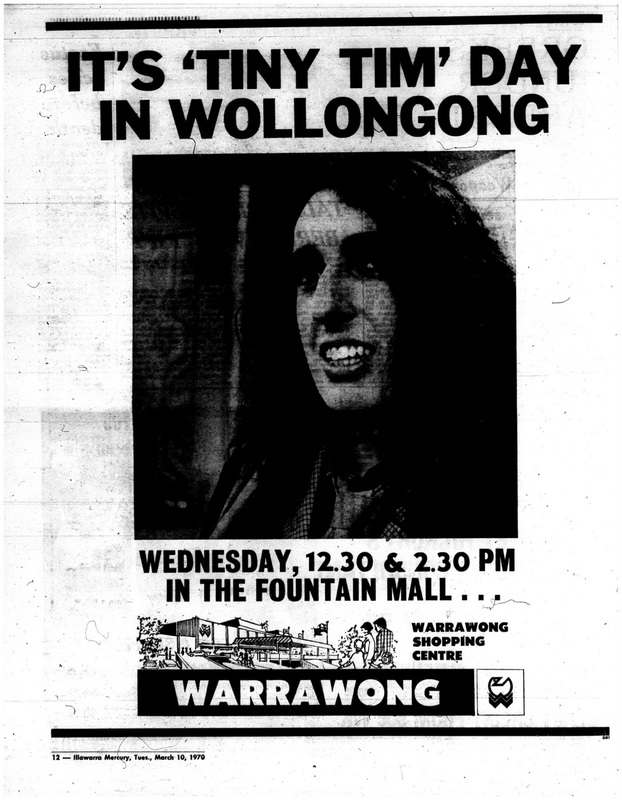 In between shows, however he was scheduled to appear at the Warrawong Shopping Centre for two afternoon performances. Speaking to the Illawarra Mercury before the scheduled appearance the centre's public relations officer Bill McCallum stated that his visit would "be all milk and honey" adding that a bathroom would be reserved for the entertainer and a "love diet of honey, fruit and peanut butter" would be available for him between shows. With more than 4000 people expected to show up, this was to be four-year old Diane Hardy's big moment. Diane, daughter of caretaker Jim Hardy, was to present a sheath of flowers to Tiny Tim after his performance. Alas, none of it was to be. Tiny Tim failed to show, stating medical reasons for his non-appearance. 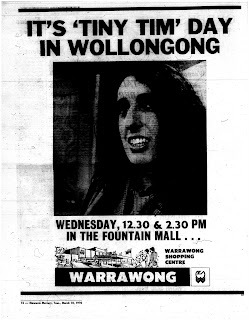 Though Tiny Tim would return to Australia in 1980 to recording the Wonderful World of Romance (limited to a pressing of 200), it wouldn't be until 1982 that he made his way back down Mt Ousley, performing at the Cabbage Tree Hotel, Fairy Meadow.